This is Zachary with Ellie from one year ago. We got her in September 2007. Now she is much bigger!!!! I love this picture though. 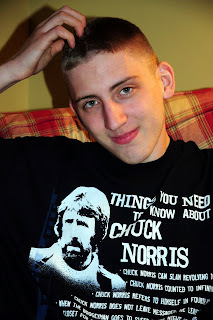 This picture was taken the night of Ahren's High School graduation. June 2007. Poppop has since passed away, so I am glad he got to see Ahren graduate. Ahren said he wished Poppop was still here to see him in the Marines. Poppop was in the Navy during WWII and I know he would be very proud of Ahren. 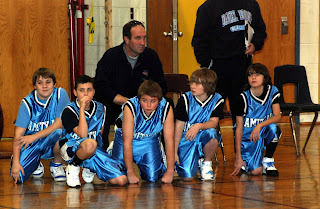 Zach on Daniel Boone Basketball Travel Team (Jan 2008) Zach is on the far right. Some friends wanted to know what is going on with Zach. He is in 8th grade now and acting like a typical teenager. He has a cell phone and is texting all the time. He's had a few girlfriends, but they don't seem to last long. 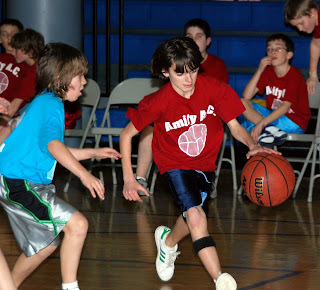 Basketball will be starting soon and he'll be too busy to worry about girls! He also wants to play lacrosse in the spring. Ahren signed up for the Marines. This is something he has dreamed of doing since he was in 7th grade. He is scheduled to leave for boot camp on September 23rd at Paris Island. When I have a mailing address I will let you know so you can write to him! Join me in wishing him Good Luck! 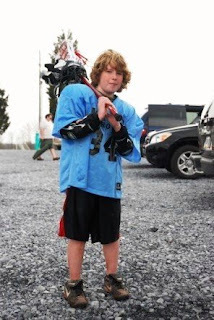 2008 Lacrosse season was Brandon's first. The game is similar to hockey, so he felt comfortable playing defense. He did well for his first year. He is very strong for 11 years old. He would hold off two or three boys at a time so they wouldn't get the ball! That's why we call him "Moose"! The 2008-09 Ice Hockey Season has begun practice. This year Brandon has joined two teams. Valley Forge Colonials and Daniel Boone Blazers. Brandon plays defense. He is awesome to watch. Every game he gets faster, stronger and confident! I don't have his game schedule yet - only practicing right now.